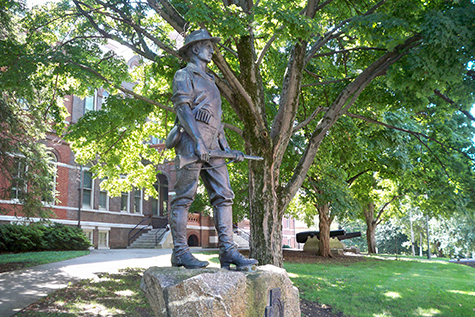 The Hiker is a statue commemorating the American soldiers who fought in the Spanish–American War, the Boxer Rebellion and the Philippine–American War. It was created by Theo Alice Ruggles Kitson. The first version of it was made for the University of Minnesota in 1906, but at least 50 copies were made, and were erected throughout the United States. When she created The Hiker, Kitson already had a reputation for sculpting war memorial statues. For the title of her work, Kitson used the term that American soldiers in both the Spanish-American War and the Philippine-American War gave themselves: "hikers". Leonard Sefing, Jr., a Spanish–American War veteran from Allentown, Pennsylvania, was selected as the model for the statue after a photograph of him was entered into a national contest. The monument was erected in Knoxville on June 30, 1940. The base of the monument is a boulder from taken from the Great Smoky Mountains National Park. Dedicated under the auspices of the Jack Bernard Camp, United Spanish War Veterans of Knoxville. Source: Wikipedia, http://en.wikipedia.org/wiki/The_Hiker_(Kitson), July 7, 2013.